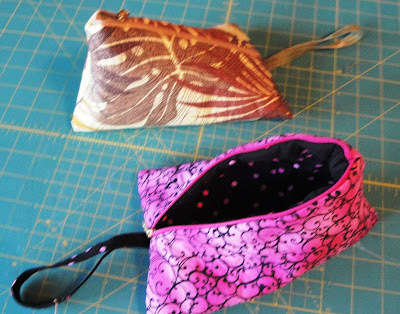 Robin has a tutorial on her blog http://robingallagher.blogspot.com/ for this Triangle Zipper Bag today. So, I stopped everything and made a couple of them. One for me and one to give away. Don't you just think they are so cute? I can see them used for all sorts of things. 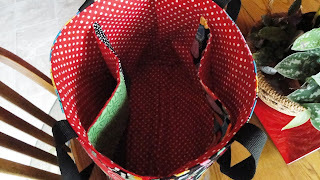 I can make one out of cute little boy fabric and put small cars or marbles inside. I can make them teen ager appropriate and add make up or hair goodies to them. Or, for the sewer, sewing supplies. Or for my mom, who is 90, I can put candy inside and send it to her so she knows I am thinking about her. Go check out robin's site and take a look. 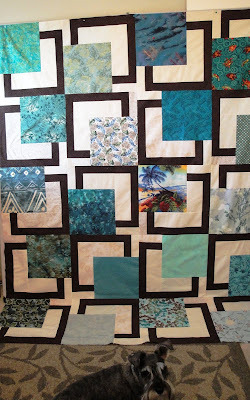 I have finished Annette's quilt top and now I need to shop for the backing and batting. The pattern Anntte selected is BQ by Maple Island Quilts. The dark frame is not black. It is a very dark brown that isn't photographing very well. Maybe when I finish it, I can get a better shot. As you can see, it is a very easy pattern that goes together quickly. I'm thinking it will fit in her dorm nicely. Size is 72" x 90" or twin size. I hope she likes it. Trudy does. 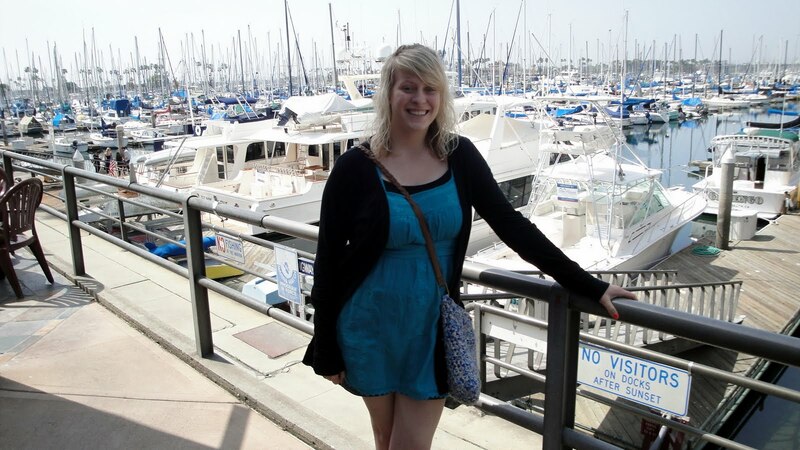 Annette will be living in a dorm when she goes to college in the Fall. I'm going to make her a dorm quilt. She asked for blue-greens: something to remind her of the ocean and the times she has spent here with me. 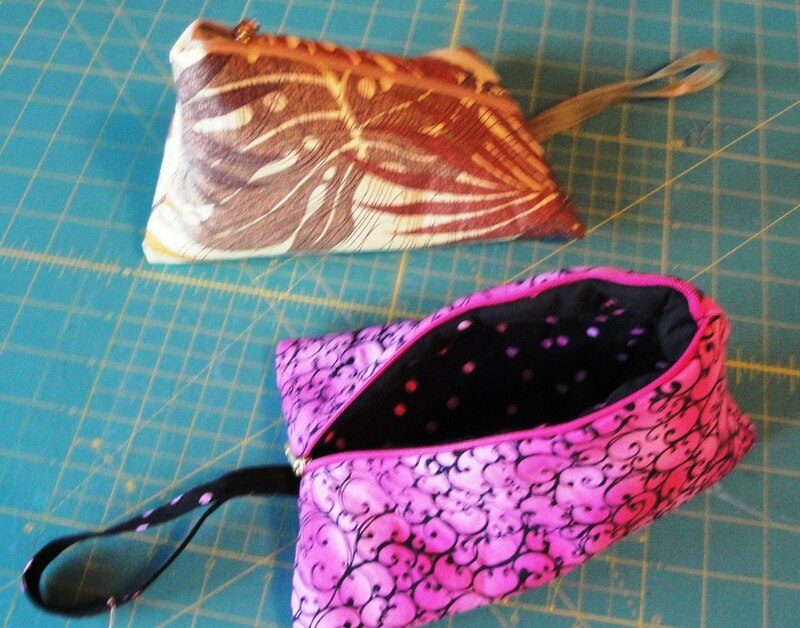 She selected the pattern and I selected the fabric. Robin and I went on a Spring Shop Hop on Friday and I used the opportunity to buy a little fabric from each of the eight shops we visited. 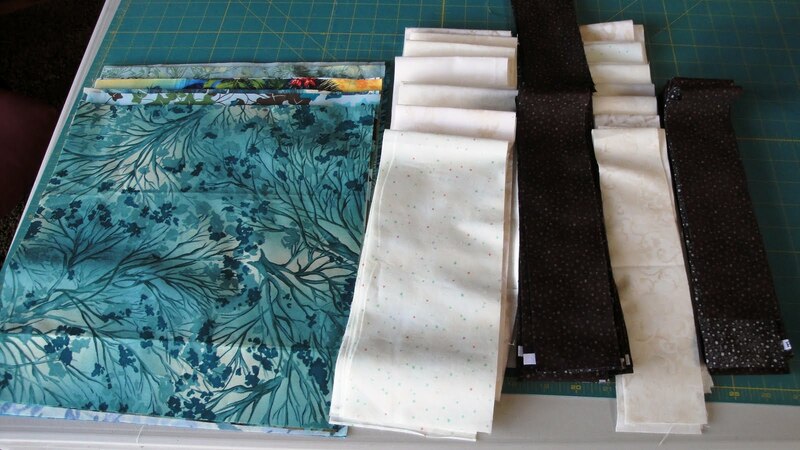 Today I cut out the fabric and am all ready to go. 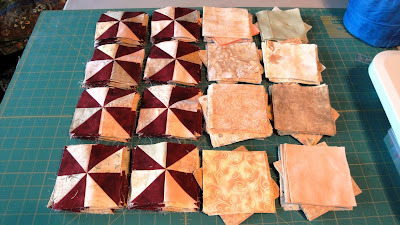 The red pinwheel quilt will be on hold until this is done. It's all for a good cause, don't you think? Happy quilting. I feel honored. 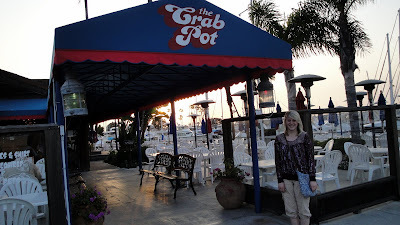 My 17 year-old granddaughter has been spending her spring break with me. We have had a special time together. 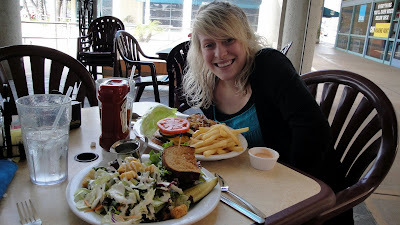 We decided that for this trip it would be "A Taste of Long Beach". That means we never left Long Beach for anything. She flew into Long Beach Airport, we played, shopped, and ate only in Long Beach. This is lunch at Thai Gormet in Belmont Shores. Schooner or Later on Alamitos Bay. Relaxing as best one can with Trudy the whirlwind terror. Dinner at the Crab Pot. Tomorrow morning she goes home. Sigh. She is a nine-month old terror. 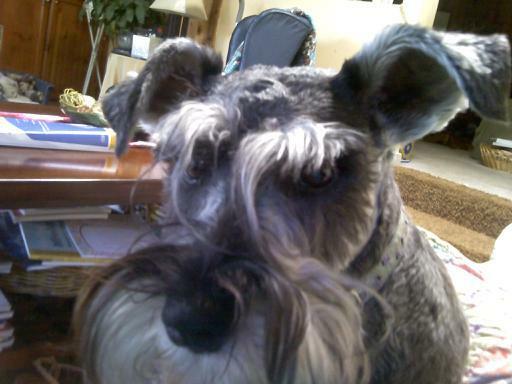 But, she is so cute and so sweet. I have 90 pinwheels sewn and a whole bunch (330) 4.5 inch squares laid out and ready to go. I have to put this away now until next week. Two Wacky Women are vending at the Glendale Quilt Show this week. So long sewing machine; I'll see you next week. 360 to be exact. But, who's counting? Now what will this be? Remember when I told you about the sugar snap peas? And how I got them from Beachgreens? Here is how it goes. Every other Friday I get this bin delivered to my door. It is like receiving an unknown gift each time. 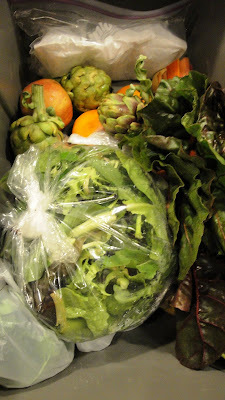 I never know what will be inside except that it will be organic fruits and vegetables, all locally grown and seasonal. Love it! 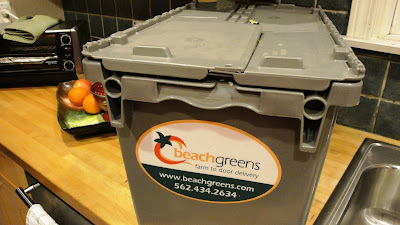 There are several options with Beachgreens. 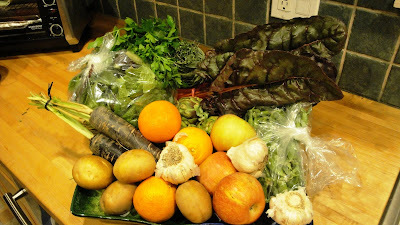 I take the mostly vegetable studio bin. This is what the bin looks like. And then I open it and see this. Thanks Aliye for all your great bins! Look what I won over at http://starbound-studios.blogspot.com/. 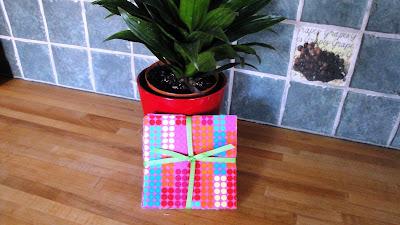 It is a great charm pack of "happy" fabrics. Dots and Spots and Stripes all bright. 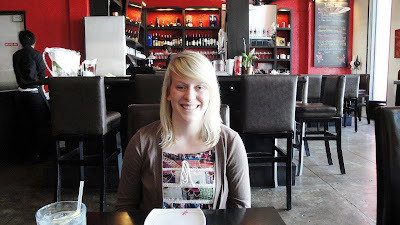 Go on over a visit Katy's blog. It is a good one. Thanks so much Katy. I love my winnings. I found this pattern I want to piece in one of my quilt books, Fat Quarter Fun by Karen Snyder. 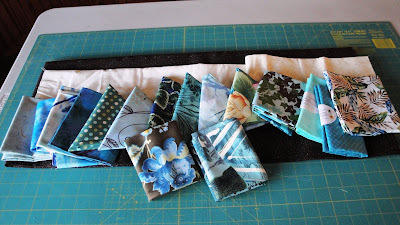 It takes 30 fat quarters and a couple of yards of an accent color for pinwheels and binding. The background is completely scrappy and blendy (is that a word?). I love scrappy backgrounds. I want to utilize my stash. After all, what is it for but to use? Right? Right? I may have to buy a few more background pieces; but then, I may just squeak by. I think I will start cutting today so if I need more I can get it on Friday. 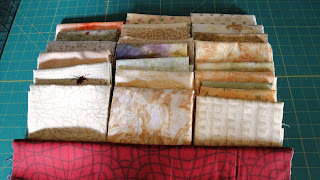 Oh, on Friday Robin and I are going on a Quilt Run in the San Diego area. Seventeen shops in all. 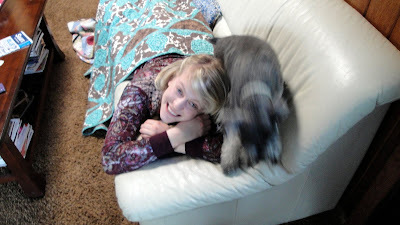 Yes, we are wacky. Arizona has some interesting places. Out in the middle of nowhere is this resurrected ghost town, Oatman. It is only a few blocks of small western stores, with touristy dustables. (I picked up a nightshirt that I shouldn't have to dust) I guess the original Route 66 used wind through Oatman. And when the new Route bypassed Oatman, the population dwindled from 10,000 to 60. That happened to many of the small towns when they built the new pass. We ate at this diner. They say there are about 10,000 one-dollar bills stapled to the walls. And then there is the gunfight in the street every so often. But mostly, Oatman is known for the wild donkeys that roam the streets looking for handouts. I'm not sure how wild they are; but, apparently they live in the hills in the area. Some of the stores sell carrots so you can feed them. They will walk up to anyone that even remotely looks like a good candidate for a handout and nudge you with their nose. There were a lot of babies about town when we were there. You are NOT to feed the babies. Probably a good idea. 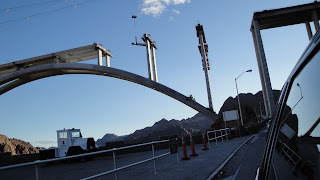 Have you driven by the new Hoover Dam Bypass Project lately? 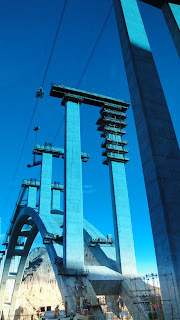 They started this project in January, 2005 with the expected completion date of Late 2010. 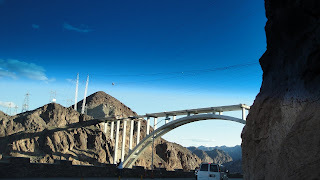 It is to be a 2,000 foot-long bridge, 900 feet above the Colorado River. 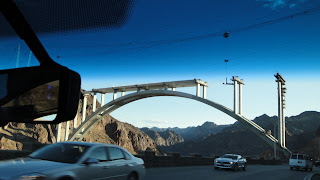 On my recent trip to Arizona, I was able to snap these photos from the car. It really is a marvel. Last night I decided to roast some sugar snap peas. I received them in my Beachgreens order recently and the suggestion was to roast them after tossing in a little olive oil and sea salt. After they roasted in a 425 degree oven long enough to brown a little I sprinkled just a few drops of sesame oil for that great flavor. Don't they look good enough to eat? Yum, just like candy. I will have to tell you more about Beachgreens sometime. 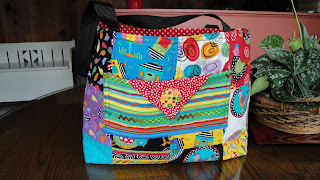 At our January Two Wacky Women Quilting Retreat, one of our retreaters, Pat Sorensen, bought a charm pack from us to make a bag for her daughter's birthday. Pat has graciously agreed to let us use this darling bag as a sample. She does want it back; after all, it is for her daughter. Just look at what you can do with a 5-inch charm pack.Thank you so much Pat for your generosity.